ABOUT SAN JUAN RESOURCES, INC.
Denotes SJR Production Areas. Wells shown from Top Mancos to all Depths Below. 1. Aztec Conventional Drilling and Production SJR operates 13 wells in this area, commingling Blanco Mesaverde and Basin Dakota in most of the wells. 2. Aztec Fruitland Wells, SJR operates ten coalbed methane wells, producing from the Basin Fruitland Formation. 3. Westflank Unconventional Drilling SJR operates acreage north of Farmington, drilling conventional Blanco Mesaverde and Basin Dakota reservoirs. SJR has undrilled gas units on these lands and offer the potential for virgin reservoir conditions. HZ drilling in Mancos, Niobrara, and other zones. 6. San Juan 32-7 Unit, operated by ConocoPhillips. SJR has an interest in 8 wells while owning a non-unit participating interest in this Basin Fruitland coal-seam reservoir, plus interests in Dakota and Mesaverde wells. 7. Rosa Unit, operated by WPX. SJR has working interest in this unit. 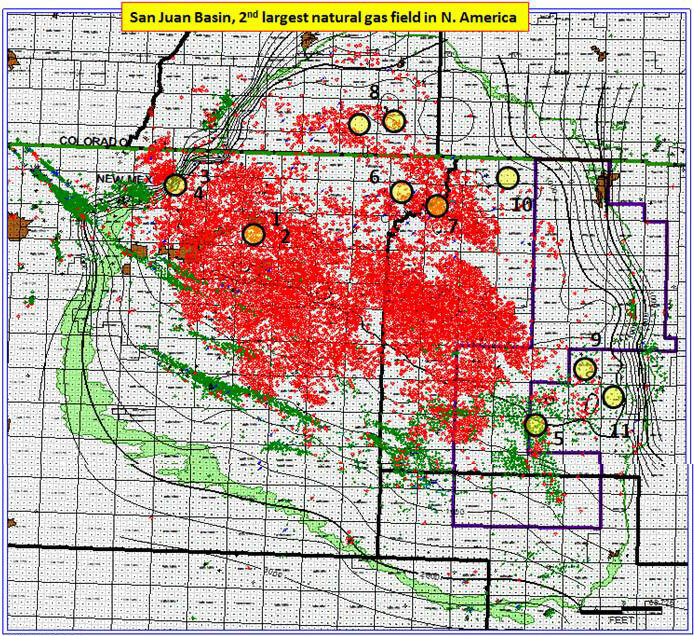 With an interest in 25 wells, SJR has a non-unit participating interest in Blanco Mesaverde, Dakota, Mancos, and Basin Fruitland coal-seam methane production. WPX has suspended Mancos drilling in this unit until gas prices rebound. Mancos produces dry gas in the Rosa. 8. La Plata County Wells, operated by Maralex Resources and Samson Resources. SJR has working, overriding royalty, and royalty interests in 11 Basin Fruitland pool coal-seam methane wells. 10. Carracas Canyon area, Fruitland coal-seam production, overriding royalty, Southland Royalty-operated wells, Basin Fruitland and PC pool, Rio Arriba County, New Mexico. 11. Canada Ojitos Unit, Benson-Montin-Greer-operated unit, Puerto Chiquito Mancos (West) Rio Arriba County, New Mexico. SJR owns a small working interest.